Flatten and converge your network: IBM® takes an open, standards-based approach to implement the latest advances in the flat, converged data center network designs of today. IBM Storage solutions enable clients to deploy a high-speed, low-latency Unified Fabric Architecture. Optimize and automate virtualization: Advanced virtualization awareness reduces the cost and complexity of deploying physical and virtual data center infrastructure. Simplify management: IBM data center networks are easy to deploy, maintain, scale, and virtualize, delivering the foundation of consolidated operations for dynamic infrastructure management. Storage is no longer an afterthought. Too much is at stake. Companies are searching for more ways to efficiently manage expanding volumes of data, and to make that data accessible throughout the enterprise. This demand is propelling the move of storage into the network. Also, the increasing complexity of managing large numbers of storage devices and vast amounts of data is driving greater business value into software and services. With current estimates of the amount of data to be managed and made available increasing at 60% each year, this outlook is where a storage area network (SAN) enters the arena. SANs are the leading storage infrastructure for the global economy of today. SANs offer simplified storage management, scalability, flexibility, and availability; and improved data access, movement, and backup. Welcome to the cognitive era. The smarter data center with the improved economics of IT can be achieved by connecting servers and storage with a high-speed and intelligent network fabric. A smarter data center that hosts IBM Storage solutions can provide an environment that is smarter, faster, greener, open, and easy to manage. 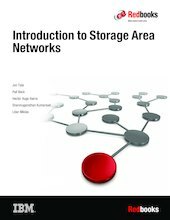 This IBM® Redbooks® publication provides an introduction to SAN and Ethernet networking, and how these networks help to achieve a smarter data center. This book is intended for people who are not very familiar with IT, or who are just starting out in the IT world.